Last week I heard something odd while driving my vehicle. I could hear my exhaust getting louder and louder the more I pressed on the accelerator as if my muffler had a hole on it. After inspecting the exhaust pipe connected to the muffler and all around the muffler canister, I couldn't find a single hole. However, the loud noise was definitely originating somewhere in that area. 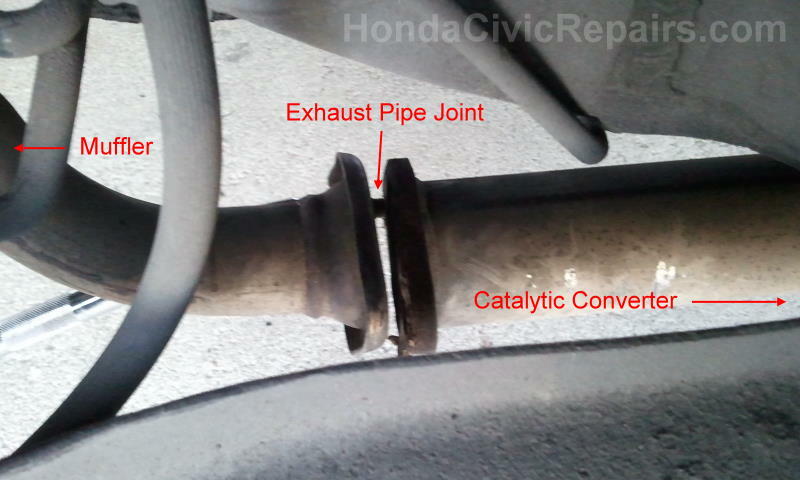 The next thing I did was unbolted the exhaust pipe that connected to the pipe towards the catalytic converter. And upon disconnecting the two pipes apart, the old exhaust pipe gasket fell out leaving nothing but pieces of disintegrated gasket remains and debris. Looks like I obviously needed a new exhaust pipe gasket. So I took a trip to my local auto parts store and got a new exhaust pipe gasket. The new gasket looks like a quarter-inch thick metal ring and looked nothing like the original gasket part that looked more like a thin ceramic sheet with 3 holes. After installing the quarter-inch metal ring, I tested the results. Although it seemed to help a little, it wasn't enough to eliminate the annoying loud combustion noise. Exhaust pipe gaskets - Honda Civic. The thicker exhaust gasket ring works best rather than the thin exhaust gasket ring shown above. So back to the local auto parts store and ordered the thicker one-inch thick metal ring. After installing the much thicker metal ring, I re-tested the results. Success. 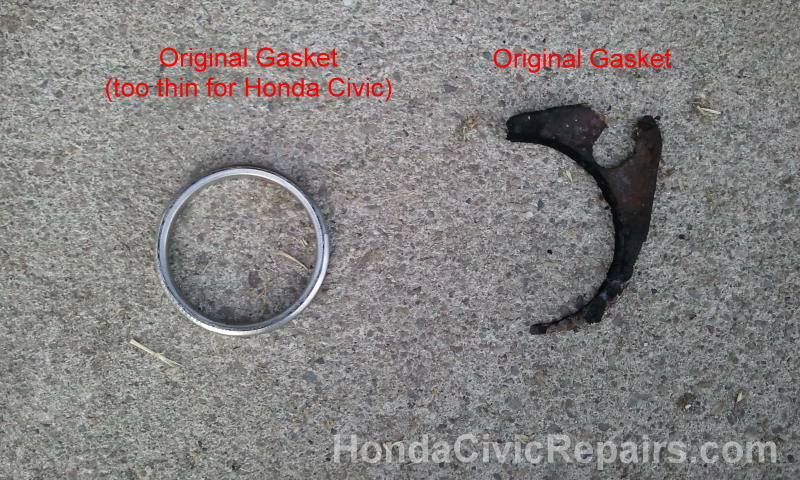 The thicker metal ring served as a much better exhaust pipe gasket. 2. Lifted the right rear end of the car until the wheel was off the ground. Used a jack and jackstands to secure the car. Placed a block of wood behind the rear left wheel for added security. 3. Removed the lug nuts (19mm) from the wheel and removed the wheel. 4. Removed the exhaust pipe bolts at the joint (14mm). 5. Replaced the old gasket with the new ring gasket. 6. Tightened the exhaust pipe bolts at the joint (14mm). 7. Returned the wheel and secured with lug nuts (80 lbs.ft). 8. Lowered the car back down.